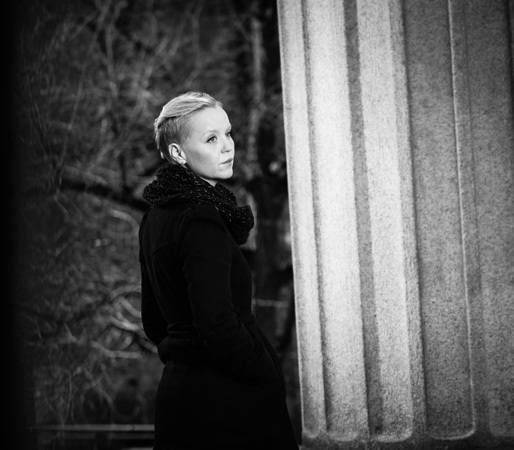 Åsne Valland Nordli (1975), from Nordheimsund on the West Coast of Norway, is a freelance vocalist working with improvisation and Norwegian folk songs. Her five albums from 1994 to 2014 has been well recieved and norwegian press has used words like “State of the art” about her work. Over the years she has played with, had conserts and recorded with norwegian jazz musissions like Nils Økland, Sigbjørn Apeland, Nils Petter Molvær, Arve Henriksen, Paolo Vinaccia, Knut Reiserud etc. She started very young, at only 14 years of age she started tutoring at the Ole Bull Academy in Voss and she had conserts all over the country. At 16 she toured with the Bergen Philharmonic Orchestra. Before 18 years of age she had sung at many norwegian music festivals, toured with norwegian jazzmusissians and released her first cd at Kirkelig Kulturverksed. Åsne Valland Nordli was in her young age awarded by the Ole Bull Academy’s Artistic Grant and the NRK (Norwegian Broadcasting) grant for Young Talent. Åsne gave concerts at festivals both at home and abroad, such as the Bath International music Festival, ”Festspillene” in Bergen, Vossa Jazz, the Telemark Festival, Natt Jazz in Bergen, Førde International Folk Music Festival, Haugesund Film Festival, Hardanger Musikkfest and the ”Hardingtonar” music festival i Norheimsund. At Hardingtonar in 1998 Åsne, together with the Ter Jungs Sextet, gave the premier performance of “Wandering Heaven” by the contempoaray composer Magnar Åm. Åm had written the work by special request and had tailored it Åsne’s voice. It was later released on the album “Hexa” (Hemera 2000). From 1998 until 2003 Åsne and her family lived in Constanta in Romania, where they worked together with local partners to develop Christian humanitarian projects reaching out to street children, victims of trafficking and other needy groups. They now live near the rural township of Stange north of Oslo. The last years she has worked mainly with the jazz pianist Kristin Skaare, fiddler Nils Økland, organist Sigbjørn Apeland and the hardangerfiddle player Benedicte Maurseth in different musical projects, at the National Theatre in Oslo and at recordings. – Hexa, Ter Jungs Sextet (Hemera, 2000). – Straum, Nils Økland (Rune Gramofon, 2000).